The members of the Amateur Astronomers Association of Pittsburgh invite the public to Mingo Observatory and Wagman Observatory, Saturday, October 3, 2015. Looking to buy a telescope, accessories, star charts and books? We’ll have free handouts, guides and booklets to point visitors in the right direction. Solar Obeserving (weather permitting) at 5:30 p.m. SAFELY View the Sun early with our 4″ Lunt Solar Telescope. Planetarium Shows (rain or shine) beginning at 7:00 p.m. Planetarium Schedule: 7:00 PM: Sky Show, 8:00 PM: Program TBA 9:00 PM: Sky Show, 10:00 PM: Program TBA Celestial Observing (weather permitting) beginning at Dusk. See wonders of the night sky through our 24 inch Ritchey-Chretien Reflector and 10 inch Refractor telescopes. Observe Double-stars, planetary nebulae, astonishing star clusters, distant galaxies. The Planets Saturn and its rings, Jupiter and its Galilean moons, Venus and more starting at dusk (sky conditions permitting! ). Mingo Creek Park Observatory is Open Rain or shine, cloudy or clear! 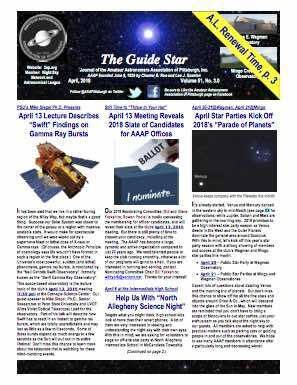 Would you like to receive occasional emails about Mingo Observatory Star Parties and Observing Events? Be sure to sign up at the Mingo Observatory Reception Desk or contact MingoAssocDirector2@3ap.org. Mingo Creek Park Observatory is Handicapped Accessible. Route 88 Construction Between Patterson Road and Ginger Hill Road: Route 88 south of Finleyville is getting some retaining wall work just north of Ginger Hill Road where lot of folks turn off of Route 88 to get to Mingo Observatory if they are coming from the north on Route 88 and planning to turn onto Ginger Hill Road. According to Penn DOT Route 88 (Finleyville Road) will be closed between Route 1087 (Ginger Hill Road) and Patterson Road beginning Monday, September 21 and will not reopen until late-October. Please plan your trip to allow for the closed section of Route 88. Ginger Hill Road runs between the ridge road, Rte. 136 and Route 88. The railroad trestle and Rte. 43 cross Rte. 88 at this intersection. Patterson Road Runs from Rt. 88 to Finleyville-Elrama Road. Finley-Elrama Road meets the River Road. Ginger Hill Road meets Route 88 to the south where of Patterson Road meets Rte. 88. Coming form the south on Route 88 folks will still be able to turn at Ginger Hill Road and proceed to Mingo as usual. However, travelers coming from the north on Route 88 will be detoured at Patterson Road before they reach Ginger Hill Road. Please check back for suggested detour information. Consider Mingo Church Road as an alternate route if coming from the North on Rte. 88. As well, if possible members may be interested use Rte. 136 if possible to avoid Rte. 88 . we will be posting a map and suggested detour. The Nicholas E. Wagman Observatory, 225 Kurn Road Tarentum, PA 15084 ~ 724-224-2510 ~ Latitude 40.627 degrees Longitude -79.813 degrees, is located in Deer Lakes Regional Park, Frazer Township, Pa., near the village of Russellton in northeastern Allegheny County and some 18 miles from Pittsburgh. Nearly 62,000 people have visited the observatory since its opening in 1987. Come and see what they’ve discovered and you’ve been missing. This event is scheduled for Saturday, October 3 starting about tba PM EDT. The Wagman Star Parties will be held WEATHER PERMITTING. The public should call 724-224-2510 for more information. Check for updates and see the Guide Star AAAP Newsletter and AAAP Facebook Page. Both observatories have park style restrooms. There is no running water. We suggest you bring bottled water and dress warmly for cool night air. The buildings and the grounds are smoke free zones. Smoke fouls telescope optics. There is no alcohol permitted. Drive slowly and carefully looking for pedestrians. Please avoid the use of white lights that destroy night vision and be courteous of others. Both facilities are entirely volunteer operated and although no admission is charged your donations support the operation of the star parties and are greatly appreciated.